AVerMedia, leader in video capturing technology, is proud to announce the availability of the CN331-H, a super-compact full HD M.2 video capture card featuring H.264 hardware compression that minimizes CPU and GPU workload. This card makes it easy to monitor, store, display and process clear high-quality video while keeping video file sizes small to save storage space. The CN331-H is a powerful but affordable HDMI video capture card that is ideal for industrial PC (IPC) formats and embedded applications in industry, commerce, education and general enterprises. Key specifications include a 1-CH HDMI 1.4 input, maximum input resolution of 1920 x 1080 at 60fps, and maximum capturing resolution of 1920 x 1080 at 30fps. Thanks to its excellent characteristics and performance, it is equally capable of being deployed in gaming PC’s, as well as commercial solutions for IPC, educational application and medical imaging solutions. Integrated hardware acceleration reduce CPU and GPU workloads for H.264 encoding, de-interlacing, color space correction, and scaling. Up to two CN331-H can work in tandem, to process multiple streams E.g. game-stream & overlay, to provide smooth, crisp video while reducing total system load. Lastly, the included HDMI cable can be connected at two different angles (0° & 90°) to allow for easy installation and flexible configuration. The small and lightweight format of the CN331-H and secure physical HDMI interface make it an excellent choice for use in vibration-proof environments like mobile equipment and gaming laptops. The CN331-H is available in 22 x 80 mm (M.2 2280) and 22 x 60 mm (M.2 2260) versions. 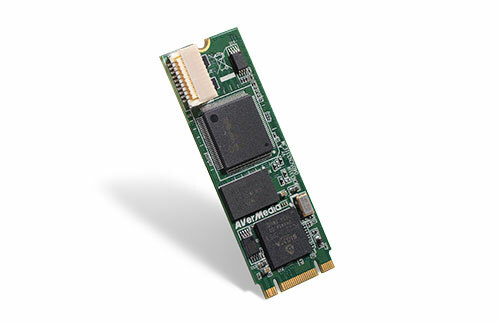 Both versions make the most of the fast, space-saving PCI Express M.2 card format. With the card’s ultra-low power consumption of only 1 watt and powerful on board video processing, its tiny size makes it perfect for small-footprint, power efficient embedded systems. To make installation easier where space is limited, the HDMI connector can be fitted at either a 90 degree or 180 degree angle. The small, lightweight format and secure physical interface design also makes these cards excellent for applications that need to be vibration-proof. Key hardware video processing functions built into the card include scaling to reduce CPU and GPU workload, de-interlacing to enhance image clarity, and color space conversion for more realistic color – together, all these functions improve responsiveness and reduce input lag. But users can always choose the data processing pathway that suits their current application, because the card is able to hardware encode with H.264, or capture in raw format without compression, or both – so there is no need to purchase and install two separate capture cards. The card is supported by AVerMedia’s versatile SDK, a set of development tools that allows software engineers to seamlessly integrate video capture modules into application-specific systems, easing development of vertical applications and speeding time to market.